As the federal agency responsible for conducting research and making recommendations for the prevention of worker injury and illness, NIOSH has undertaken a reappraisal of how to ensure optimal protection of workers from exposure to asbestos fibers and other elongate mineral particles (EMPs). As a first step in this effort, NIOSH convened an internal work group to develop a framework for future scientific research and policy development. This State of the Science and Roadmap for Scientific Research (herein referred to as the Roadmap), clarifies NIOSH’s REL, summarizes NIOSH’s understanding of occupational exposure and toxicity issues concerning asbestos fibers and other EMPs, and identifies key issues which need to be resolved to allow NIOSH to update its REL. In 1990, NIOSH reviewed the available information on EMPs from the nonasbestiform analogs of the asbestos minerals. The epidemiological evidence was considered inconclusive, and the toxicological evidence was interpreted to mean that carcinogenic potential depends on a mineral particle’s length and width and neither chemical composition nor mineralogical origin are critical factors in determining a mineral particle’s carcinogenic potential. NIOSH also considered the lack of routine analytical methods to accurately and consistently distinguish between asbestos fibers and nonasbestiform EMPs in air samples. As a result of the review, NIOSH revised its REL at that time, retaining the 0.1 f/cm3 limit but explicitly encompassing EMPs from the nonasbestiform analogs of the asbestos minerals as a precautionary measure. Uncertainty remains concerning the adverse health effects that may be caused by nonasbestiform EMPs encompassed by NIOSH since 1990 in the REL for asbestos, and the Roadmap does not change NIOSH’s REL. In the Roadmap, NIOSH makes clear that such nonasbestiform minerals are not “asbestos” or “asbestos minerals,” and no longer refers to particles from the nonasbestiform analogs of the asbestos minerals as “asbestos fibers.” However, particles that meet the specified dimensional criteria remain countable under the REL for the reasons stated above, even if they are derived from the nonasbestiform analogs of the asbestos minerals. NIOSH’s intent is to reduce existing scientific uncertainties, to resolve current policy controversies, and to update its REL. To help accomplish these goals, the Roadmap proposes that interdisciplinary research address the following three strategic goals: (1) develop a broader and clearer understanding of the important determinants of toxicity for EMPs; (2) develop information on occupational exposures to various EMPs and health risks associated with such exposures; and (3) develop improved sampling and analytical methods for asbestos fibers and other EMPs. The results of the research programs are intended to provide a sound scientific foundation for development of future recommendations that provide optimal health protection. 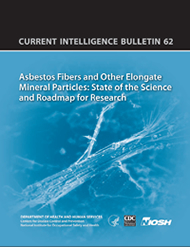 Originally published in March 2011, the Roadmap was revised in April 2011 to (1) correct an erroneous statement that NIOSH adopted the designation of asbestos as a “Potential Occupational Carcinogen” § in the 1970s; (2) more clearly indicate that NIOSH has determined that exposure to asbestos fibers causes cancer and asbestosis in humans; and (3) provide an updated discussion of the potency of chrysotile for causing mesothelioma. *NIOSH’s use of the term “Potential Occupational Carcinogen” dates to the OSHA classification out-lined in 29 CFR 1990.103, and, unlike other agencies, is the only classification for carcinogens that NIOSH currently uses. The National Toxicology Program, of which NIOSH is a member, has determined that asbestos and all commercial forms of asbestos are known to be human carcinogens based on sufficient evidence of carcinogenicity in humans. The International Agency for Research on Cancer (IARC) concluded that there was sufficient evidence for the carcinogenicity of asbestos in humans.